Thank you to all of our supporters that followed the PINK carpet to our booth and supported our cause at the Toronto International Snowmobile, ATV & Powersports Show held at the International Centre this past October. CONGRATULATIONS to Dave Helmer for winning our early bird raffle draw prize. He was shocked to find out that he had won the Early Bird prize, a 2014 Can-Am Outlander 650 XMR (sponsored by Factory Recreation). Upon picking up his ATV at Factory Recreation he said he would be back soon to pick up the 1st prize 2015 Ski-Doo MXZ TNT 900 as good karma seemed to be on his side! Thank you Dave for supporting our cause and have fun on your new Can-Am! For the rest of you that purchased raffle tickets, have no fear you are still in it to win our remaining prizes to be drawn on February 7, 2015 at 9:30 pm. For those that would still like to have a chance at the next draw, please stop by your closest Royal Distributing location or Factory Recreation in Midland to purchase your raffle ticket. 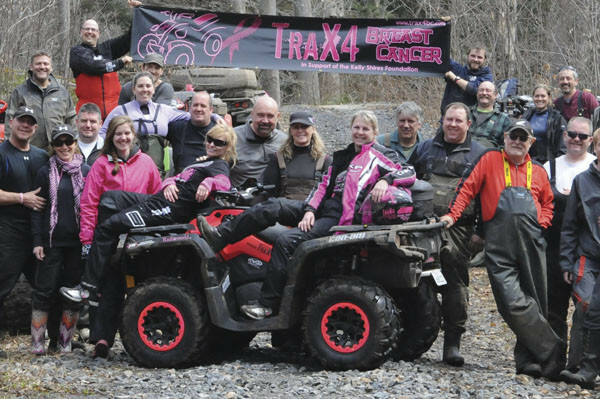 Save the Date: The 2015 TraX4 Breast Cancer ATV Event May 1st & 2nd. Get registered now and get your fundraising underway!